Are you fair dinkum about Australian crime fiction? We are. When a popular young woman is strangled in her home in the seaside village of Murloo, the residents are sure an itinerant surfer who disappeared after the murder is the killer. However, one year later the surfer is still missing and the killer’s identity remains a mystery. The victim’s family call in investigative journalist Dusty Kent who has an impeccable record in solving the cold cases she writes about. Dusty’s determination to investigate unresolved crime is fuelled by a personal connection through her own family tragedy. However, this case tests Dusty to the limit and she despairs of ever catching the callous killer who seems to be lurking nearby and yet…A gripping mystery imbued with the ambience of Australia—from the mysterious wood carving found with the body, the captivating characters of a small town, to the coastal splendour of the Southern Ocean. 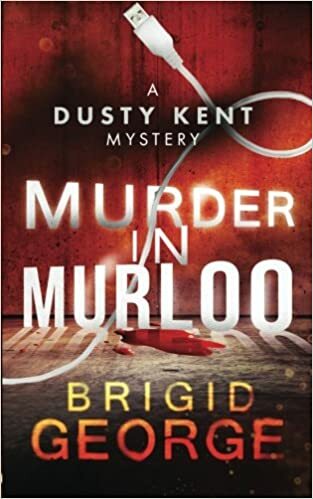 Murder in Murloo is a classic who-dun-it introducing Dusty Kent written by JB Rowley and published under the pseudonym Brigid George. Journalist Dusty Kent is investigating the unsolved murder of Gabby Peters one year after the event, telling everyone she is writing a book. Together with recent arrival from Ireland Sean O’Kelly who is a super “online” hacker and sleuth, she interviews the entire town, trying to find out where everybody was when Gabby was killed. The method produces an overwhelming amount of information including some which the residents did not reveal to the police at the time when they were first interviewed. The local police warn Dusty off, telling her she is stirring up trouble, muddying their own investigation. But Dusty has a contact in the police force who she talks to from time to time. Dusty’s methodology also has the effect of giving the reader a bewildering amount of data to sift through. The setting is close to a surfing beach on the southern coast of Victoria. In classic Poirot style Dusty holds a gathering where she reveals the murderer, and other surprising facts come to light too. An interesting start to what is now a series of 4 novels, in which O’Kelly appears to act as Dusty’s Watson, recording the cases in his diary. I read this book on my Kindle but now can’t find the Kindle version on Amazon.com. Brigid George is the pseudonym of JB Rowley; author of Amazon #1 Bestsellers ‘Whisper My Secret’ and ‘Mother of Ten’. JB also writes children’s stories such as ‘Wilhelmina Woylie’ and writes the Dusty Kent Murder Mystery series (starting with ‘Murder in Murloo’) under the pen name Brigid George. All blog content athttp://fairdinkumcrime.com is licensed under a Creative Commons Attribution-NonCommercial-ShareAlike 3.0 Unported License.